While we muddle through another lockout, it’s not a bad time to take a look back at the top performers at each position in terms of Efficiency Per Game (EPG) and Efficiency Per Minute (EPM). Here are the top 10 in EPG at each position; only players who played 41+ games qualify. The point guard list looks pretty solid; Ray Felton chimes in at #10 after a strong start with the Knicks…Westbrook’s efficiency stats look great because he’s really an off guard who is playing point guard. It’s important to consider assists and turnovers when evaluating point guards…John Wall makes the list in his rookie season — not bad considering how tough it is to learn to play the position in the NBA…At SG, it’s interesting to note how thin the position is these days — just look at Stephen Jackson making the list with 15.0 EPG and a very mediocre EPM…Andre Iguodala is very solid all-around off guard and these numbers don’t even reflect how good of a defender he is. No surprise at 1/2 with LeBron James and Kevin Durant at small forward…No surprises really until #9 and #10 with Dorell Wright (who had a nice season for a bad Warriors team) and Wilson Chandler (whose numbers were boosted by his start with the Knicks)…Considering the Bobcats pretty much gave him away, Gerald Wallace comes in strong at #6…The power forward list is solid with Kevin Love surprisingly dominating both categories. In fact, he had the highest EPM in the league, which makes the fact that he came off the bench earlier in his career all the more unbelievable…How good can Blake Griffin be? Howard dominates the position but still can’t shoot free throws or convert in the post in crunch time…This list is a good snapshot of the position…The Nuggets need to re-sign Nene Hilario to stabilize the frontcourt and build on the team’s good play at the end of last season. He is a quality big man when healthy…Andrew Bynum’s EPM is the third-highest at his position, but the big question with him are those knees…Andrew Bogut posted the 5th-best EPG despite dealing with a recovering elbow. Just how good is James Harden? When the Oklahoma City Thunder drafted James Harden #3 overall in the 2009 draft, it was a sign that the team had confidence in Russell Westbrook as their point guard of the future. After all, the 2009 draft was loaded with point guards (Ricky Rubio, Ty Lawson, Brandon Jennings, Stephen Curry, Jrue Holiday and Darren Collison, to name a few), but the Thunder elected to go with a shooting guard instead. After the 2009-10 season, while Tyreke Evans was winning Rookie of the Year, and while Jennings, Curry, Collison and Taj Gibson were joining Evans on the All-Rookie First Team, Harden was something of a disappointment. He was an important player in the Thunder rotation, but he came off the bench and could only muster an All-Rookie Second Team nod. It was a solid if unspectacular rookie season. Now, with the Thunder in the Western Conference Playoffs, Harden is playing 31+ minutes off the OKC bench and is often closing out games. He’s like Manu Ginobili — he’s not a starter, but he’s a closer, and that’s what matters. It got me wondering — how does Harden’s playoff performance (12-5-4 on 46% shooting) stack up with other guards his age (21)? It’s not too surprising that Carmelo Anthony was left off considering the way things went down in Denver this year. The sportswriters and broadcasters who vote for this aren’t going to reward him for holding his team hostage all season. I am surprised that Russell Westbrook made the Second Team over Chris Paul, who carried the Hornets to a playoff berth. Perhaps Dirk Nowitzki should have made the First Team over Kevin Durant, since the Mavs finished with a better record, though an argument could be made for Durant. Interestingly, all 15 players were on winning teams, which might explain why Kevin Love and Blake Griffin didn’t get more votes. The ad is based on that quote. Rose totaled 1,182 points including 113 first-place votes, from a panel of 120 sportswriters and broadcasters throughout the United States and Canada as well as an NBA MVP fan vote. Rounding out the top five in voting are Orlando’s Dwight Howard (643 points, three first place), Miami’s LeBron James (522, four first-place votes), the Los Angeles Lakers’ Kobe Bryant (428, one first-place vote) and Oklahoma City’s Kevin Durant (190). As I discussed back in early March, I agree with the selection of Rose since he led his team to the league’s best record after losing his team’s second and third best players for big chunks of the season. 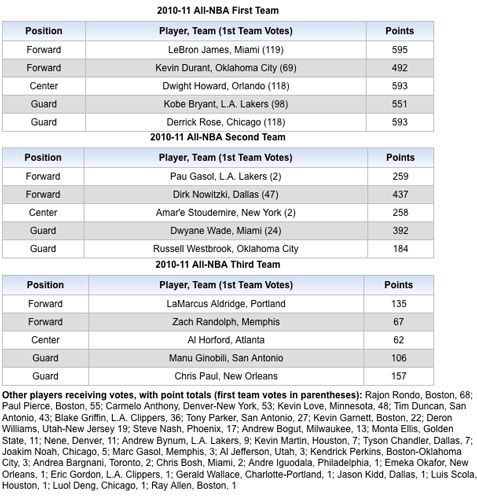 I am a little surprised that Dirk Nowitzki didn’t crack the Top 5 in voting, though Kevin Durant is surely a rising star. It’s interesting that Dwight Howard beat out LeBron James and that Dwyane Wade didn’t make the Top 5 at all. Who is going to win the 2010-11 NBA MVP?